DeCourcey's detachment remained in possession of Wilson's Gap until the main body had safely crossed, including General Baird's brigade which crossed during the night and following day (June 11 and 12) and then marched along the crest of the mountain to Rogers' Gap, descended and re-joined the column in their Powell's Valley camp. 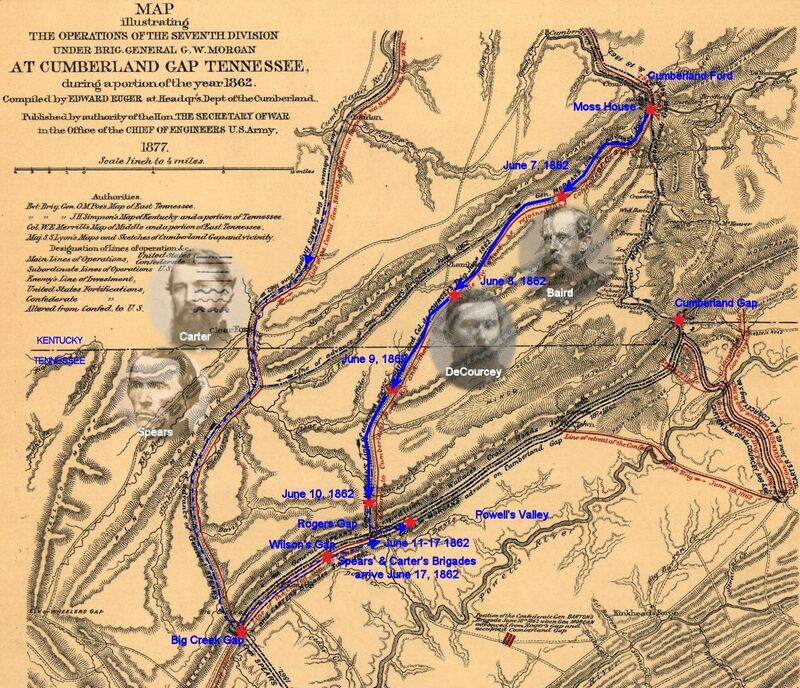 General Baird's and Col. DeCourcey's brigades now waited in their Powell's Valley camp for the brigades of Generals Spears and Carter who were crossing the mountains fifteen miles further west at Big Creek Gap (La Follette, Tennessee). One should be reminded that General Morgan had been conducting concealing maneuvers from the time it arrived at Cumberland Ford, on May 22, until the present. Amazingly, though the Confederates knew there were some Union troops and activity in the area of Roger's Gap, they still had no idea of the presence of Morgan's entire division in Powell's Valley, within easy striking distance of their stronghold at Cumberland Gap. Ironically, the speed and success achieved by Morgan fooled not only the Confederates but Morgan's own commander, General Buell. Buell had taken another force toward Chattanooga in an attempt to take that place but failed. This allowed Confederate General Kirby Smith and his entire force at Knoxville to reinforce Cumberland Gap and invade Kentucky. Buell had assumed Morgan's army had not yet crossed the Cumberlands into Tennessee and, fearing an almost certain invasion by Kirby Smith, abandoned the goal of taking Cumberland Gap and sent orders to Morgan to fall back to the Cumberland River (near Cumberland Ford north and west of Cumberland Gap) and oppose such an invasion. Buell had no idea Morgan was already in position to take the Gap. About one o'clock of the morning of the 12th inst. Genl. Baird's Brigade (the 27th) arrived and on this same day General Morgan received orders from Genl. Buell, to re-cross the mountain and retire his whole force to Williamsburgh. The order was made known to the troops and gave universal dissatisfaction. They had worked hard, crossing the mountain at a point hither to deemed impracticable for trains, been on short allowances of provisions, and then after all their toil, and fatigue, to be compelled to retrace their steps, was rather provoking. However, orders must be obeyed, and the countermarch commenced. Luckily for the 26th Brigade, it was ordered to bring up the rear, the Artillery worked all night to get up the mountain and we had to wait until every train, wagon, and everything liable to capture had safely crossed. On the morning of the 13th inst, a countryman, and a Union man, brought the news that Cumberland Gap was being evacuated, which information Colonel de Courcy forwarded with dispatch to General Morgan, at the same time ordering the 26th Brigade and one Battery not to move untill further orders. We waited anxiously for a reply, for I myself, firmly believed that the information we received was correct. Finally the answer came. Col. de Courcy's course was approved of and the whole of the Division ordered up. Morgan's four brigades quickly assembled in Powell's Valley, near the foot of Roger's Gap. General Morgan arrived there on the morning of June 14 and Gen. Baird's brigade on the 15th, marching down the mountain to the tune of Dixie played by the 33rd Indiana band. On the night of the 15th (assumed) a letter from the Confederate commander at Cumberland Gap was intercepted. It showed the Rebels were very alarmed at the exaggerated reports of Morgan's strength. It also mentioned Confederate troops were moving to attack Morgan in Powell's Valley with heavy reinforcements coming from Knoxville. It seems that time was of the essence. It was not likely that Morgan's smaller force could withstand the larger Confederate force, consisting of the Cumberland Gap garrison and Kirby Smith's approaching troops, in an open fight in Powell's Valley. However, if they take the high ground and occupy and fortify the Gap, they would be able to stop the much larger force. Meanwhile, Carter's and Spears' brigades arrive on the 17th so worn out that a day of rest was ordered before any engagement could occur. The enemy was reported at Thomas' farm, eight miles further on the road to the Gap, thus, even though the Gap had been evacuated, it was assumed a battle must be fought in the valley to acquire the stronghold. The stage was set. Information and some paraphrasing, above, taken from The Forty-Second Ohio Infantry - A History of the Organization and Services of That Regiment In the War of the Rebellion, 1876 - F. H. Mason, late Private of Company A - Cobb, Andrews & Co., Publishers. Military map showing the approximated campsite of the 16th Ohio with Col. John F. DeCourcey's and Gen. Absalom Baird's brigades from June 11 to 17, 1862, before advancing on Cumberland Gap. Note that Generals Spears and Carter were also advancing, having travelled south and crossing the Cumberland Mountains several miles to the west, joining up with DeCourcey and Baird on June 17.